Several years ago, Agnes Feidt was with a group of friends when one of them proudly displayed a new rosary. "We all commented on it and asked her where she got it," Agnes tells us. "She said she'd taken some beads from a necklace and used those to make the rosary." That inspired Agnes to do some rosary making of her own. And she's become something of an inspiration herself. Today, using beads given to her by her children and others, 89-year-old Agnes has, "little by little," become quite the rosary artist. "I can't begin to guess how many I've made," Agnes tells us. "There for a while, I was making them quite regularly.… I've made quite a few of them during the past 10 or 15 years." It became something of a calling when Agnes' rosaries started making their way into the hands of grateful patients. Much to the delight of Rev. Jennifer Larson LaRue, regional site chaplain for Mayo Clinic Health System locations in Barron, Bloomer and Osseo, Wisconsin. Larson LaRue was alerted to Agnes' expanding rosary collection by Agnes' daughter — and Mayo Clinic Health System paramedic — Mitzie Feidt. "When Mitzie reached out to me to let me know her mom was making her own rosaries and that she was interested in donating them to our patients at Mayo Clinic Health System, I said, 'That's awesome!'" Larson LaRue tells us. "The rosaries we typically use here are fine, but they're just out of a catalog." 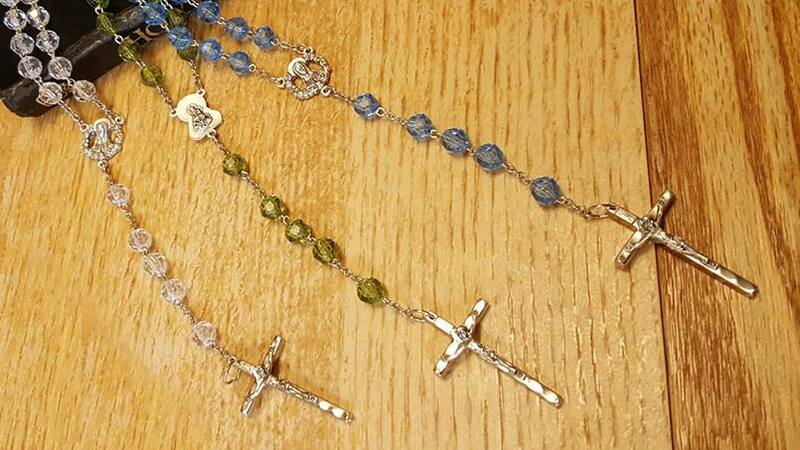 Agnes' rosaries — which also are given to patients at Mayo Clinic Health System in Eau Claire — have a little something extra. Not only are they "beautiful," they also add to the "hometown hospital feel" Mayo Clinic Health System sites pride themselves on offering to patients, Larson LaRue tells us. "These rosaries are just one more thing we can give to our patients to offer them comfort and support in what can be stressful, difficult, sometimes painful times," she says. The response from patients, Larson LaRue says, has only solidified that feeling. "The reaction from patients has been overwhelmingly positive," she says. "They always comment on how beautifully made the rosaries are, and when I tell them one of our employee's moms makes them, most think that's pretty neat." Asked what she, personally, likes best about the rosaries Agnes brings in "every six months or so," Larson LaRue tells us it's that no two are ever the same. She also appreciates that Agnes takes the rosaries to her local priest to have them blessed for future recipients. "Nine times out of 10, when people are in the hospital they don't have a chance to bring all of the things from home that might bring them comfort," Larson LaRue says. "I think it's neat to have something we can offer that's not only going to bring them comfort, but that's also obviously handmade with a lot of love and care." Show us you care by sharing your comments below. Then, you can use the handy social media tools atop this page to share this story with others.